one of the winners of the IT Innovation Award 2018.
their way to a successful digital future. with full functionality for your Linux server? A real alternative for administrators? and free administration tool KeyHelp®! by its easy handling and numerous functions. You are not using KeyHelp® yet? How good is the best hardware if you can only laboriously configure and manage your server or if you can not use all the possibilities of your server? Over 20 years of experience show us, that excellent hardware with the best possible processing also requires reliable operating systems and the best administration. Only with coordinated software and professional configuration of all system functions the full potential of brand servers can be utilized. Already with the delivery of our first machine our customers were asking for a reliable and flexible administration software as an intelligible and free alternative to Plesk, Confixx or cPanel. That was the birth of KeyHelp®. Bereits mit der Auslieferung unserer ersten Maschinen fragten Kunden nach einer zuverlässigen und flexiblen Administrationssoftware, nach einer verständlichen sowie kostenfreien Alternative zu Plesk, Confixx oder cPanel. Das war die Geburtsstunde von KeyHelp®. KeyHelp® already runs on thousands of machines and is now available to everyone. We want to develop it as a real alternative to commercially available server administration software actively together with you as a community. And in the way our customers always wanted it to be: free, unrestricted, for an unlimited number domains and even without instructions or familiarization easy to use. With KeyHelp® we provide an among insiders very popular administration tool for your Linux server available (for Ubuntu and Debian). KeyHelp® is especially appreciated because the freeware can be used for an unlimited number of domains. The free management software for servers convinces with its clarity coupled with numerous useful functionality. KeyHelp® reduces licensing costs for your hosting. Businesses and private website operators can operate a cost-effective hosting with KeyHelp.. Although KeyHelp® is free, unrestricted access to all functions and all the advantages of the administration tool are available at all times. You can use KeyHelp® for the administration of an unlimited number of domains. Again, there are no hidden costs or conditions for you. Save time and nerves. The simple interface allows intuitive operation, without instructions or training. So you can set up your server more quickly. Ask your questions directly in the KeyHelp® Forum. Share your questions with the community and actively contribute to the further development of KeyHelp®. 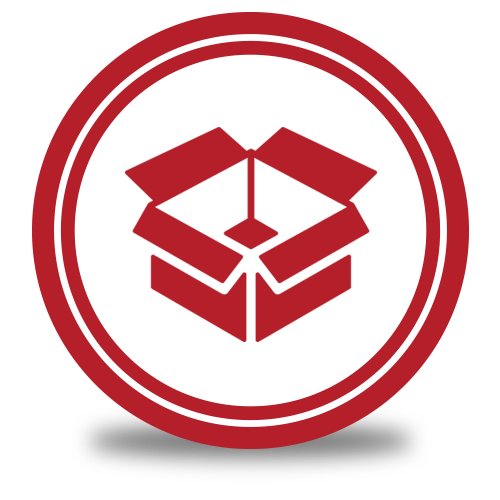 Or get fast and individual answers from the KeyHelp support team via additional support packages. With regular updates KeyHelp® does not only take care of the administration software itself, but also other services will be optimized. Thus, as soon as possible vulnerabilities (e.g. Poodle) are closed and your server is kept safe and up to date. KeyHelp® reduces licensing costs for your hosting. Businesses and private website operators can operate a cost-effective hosting with KeyHelp. 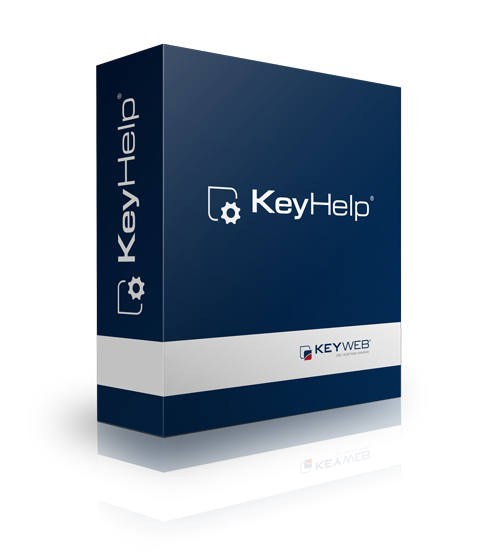 Although KeyHelp® is free, unrestricted access to all functions and all the advantages of the administration tool are available at all times.. The administration interface of KeyHelp® is extremely user friendly and clear. Even without deep technical knowledge you can take full advantage of the wide range of functions thanks to a particularly simple user interface and menu design. 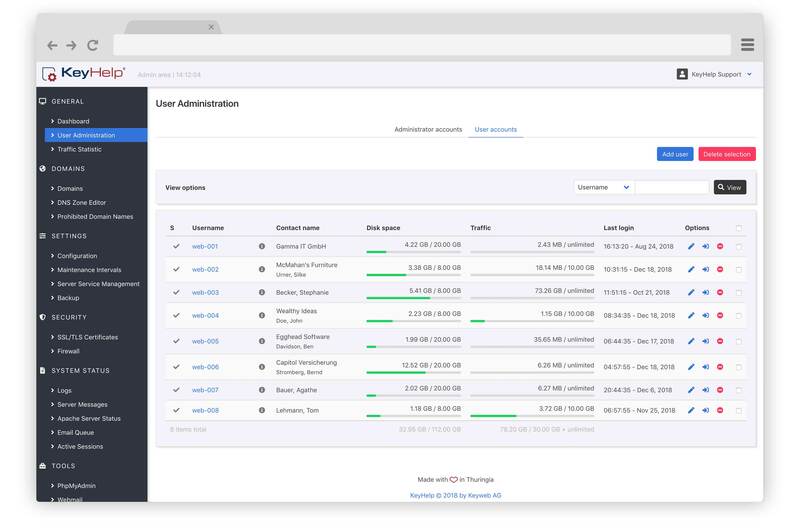 Manage your web server without familiarization with our administration software, and without knowledge of the operating system – easy, fast, without compromise. With KeyHelp® you can easily manage your e-mail address and create aliases or redirections, also catchall e-mail addresses are possible. Also for your e-mail security is taken care, so that e-mails get checked for spam or virus suspicion directly on your server. A part of KeyHelp® is the webmail software Roundcube, which allows you to manage your e-mails online easily and everywhere via the browser. 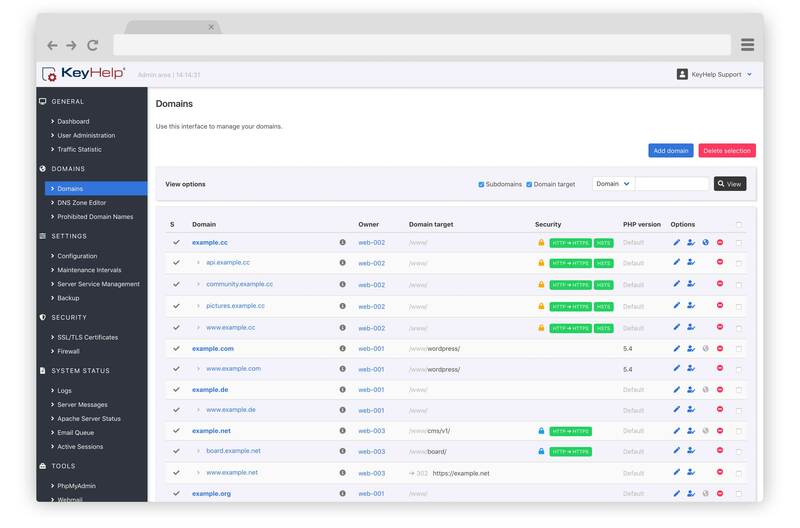 Manage any number of domains and add domains to the webhosting packages of your users. A variety of options is available to you: Extend the domains with subdomains and protect your domains with SSL certificates or create custom DNS settings. With KeyHelp® you can create and manage any number of users. 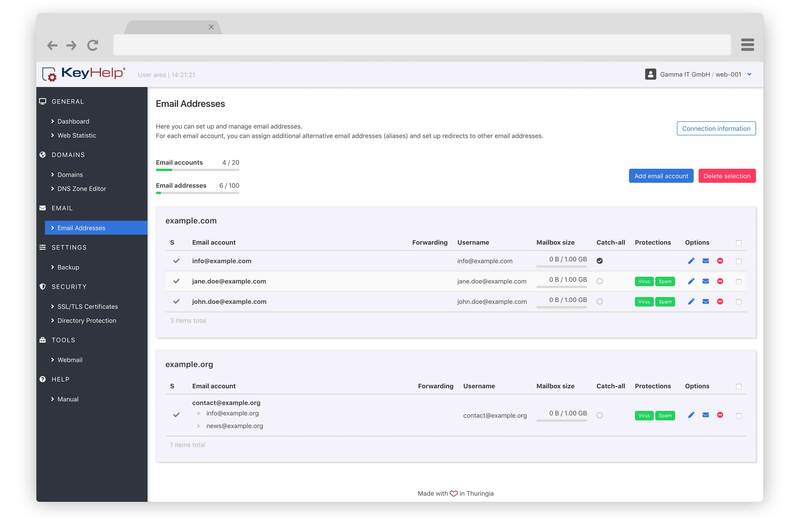 Assign them individual resources and permissions on your server (memory, number of usable e-mail addresses, PHP settings, and many more). Furthermore, you can create additional administrator accounts to jointly manage your KeyHelp® installation. You have to log in as root user to install KeyHelp®. Only install KeyHelp® on a freshly installed operating system. 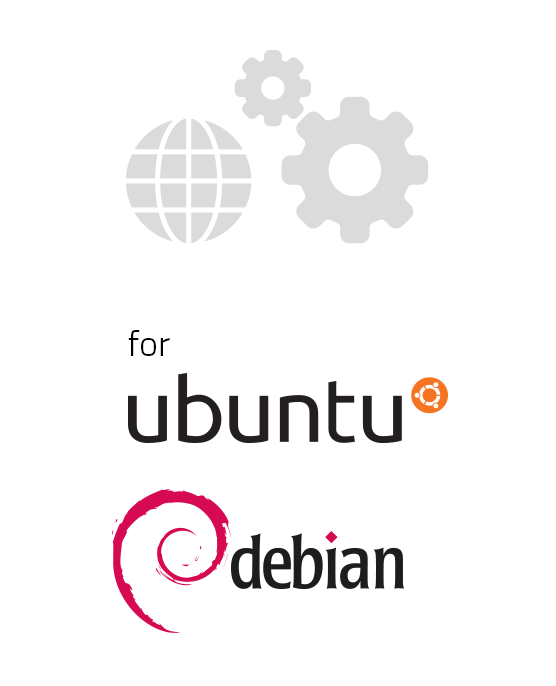 Currently the operating systems Ubuntu LTS and Debian are supported. We do not offer an uninstaller. If you want to remove our software, you have to reset the server manually. KeyHelp® will guide you through the installation. 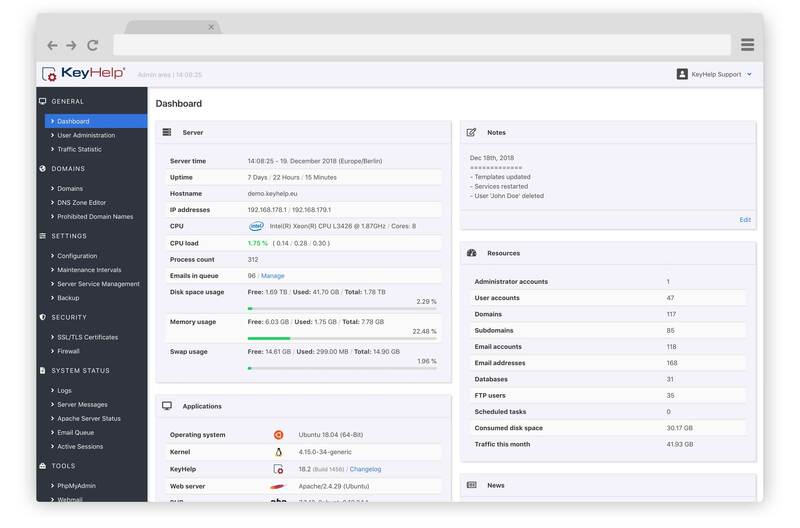 After that you can use your new server management tool immediately without any restrictions. Do you need help with the installation? Our KeyHelp® Community will help you.